Evidence For Gods Existence and Identity Newly edited version 3-9-12. There are many contradictory beliefs about God that claim to be the truth. But since truth never contradicts itself, who really has the truth? Utilizing objective evidence like a detective does in an investigation, the facts point to the one belief that can be proven beyond a reasonable doubt. One truth that applies to everyone if they believe it or not. Follow the evidence and see for yourself. Setting feelings and what others believe aside for a moment learn why objective evidence is the best way to find truth in any investigation, including the truth about God. See for yourself exactly why Christianity is the most reasonable belief available based on the facts and why it applies to everyone, everywhere even if they do not believe it. Learn the two things we all encounter daily that the Bible states is absolute proof of God's existence and leave every person without excuse, even those who have never read the Bible. Learn why trying to be a good person is not good enough. Weigh the objective evidence for yourself and make a reasonable decision about God and then pass the evidence on to others so they can discover the truth. Everyone deserves the opportunity to examine the evidence for themselves. 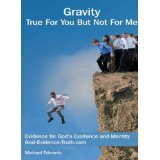 Perfect for the seeker and the believer who want to eliminate doubts and have a reasonable assurance that their faith is actually placed in the truth.If you are a believer you have an obligation to share the truth. Let this book show your friends and family the sound foundation your belief rests upon. It's not about religion, it's about truth.